These islands are an archipelego of some 184 islands scattered between to the east of India and and west of Burma. The islands were initially claimed by Denmark and Austria in the Eighteenth Century as Europeans scrambled for influence amongst the rich sea routes around India and the Spice Islands. The islands possessed some superb harbours but were very dangerous for shipping as they lay between the SW and NE monsoon rain systems. This meant that there were frequent wrecks occurred on the island reefs and beaches and survivors were often met with harsh inhabitants who despatched them mercilessly. It was with the idea of making these islands safe for ship-wrecked sailors that Lieutenant Blair of the Indian Navy was first deputed in 1789 to found a colony on an island near the mouth of a magnificent harbour, later to become Port Blair. The settlers, however, met with such hostility from the aborigines that they soon moved to an equally fine harbour in the north, later to be named Port Cornwallis. It was in the harbour of Port Cornwallis that the British fleet anchored for some time during the war with Burma. However, with the end of Napoleonic War, the British abandoned the colony. Although the Danes had not completely given up on their claims and tried to reannex them in 1845. However, this was short lived and the rights were soon signed back over to the British. The Andamans found their true purpose with the Indian Mutiny. Suddenly, a group of isolated islands off the main coast of India would provide a natural holding area for any mutineers that were captured, especially as the Indian prisons were full to bursting capacity. In March 1858, Dr James Walker, chosen to be the first superintendent of the settlement arrived at Port Blair aboard an East India Company's steam frigate carrying two hundred convicts. Little remained of Blair's former efforts at colonising. In that latitude and with the heavy rainfall the jungle grew incredibly quickly and Walker had to start from scratch. He was an able but unimaginative man. His methods of dealing with his charges were severe. 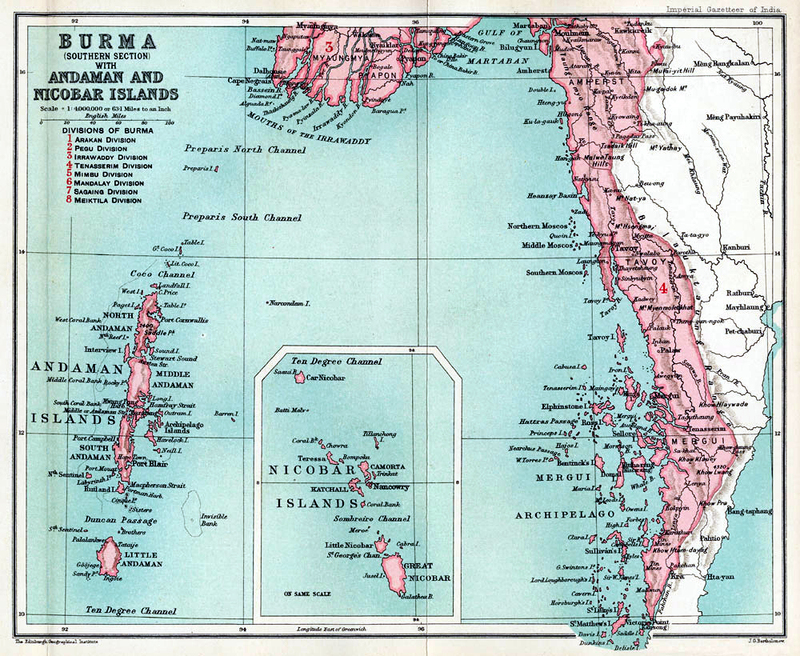 Attempts at escape began at once, the convicts having the idea that the Andamans were connected by land to Burma. Many were killed by the islanders. Some were captured and hanged as were those who gave themselves up after nearly starving to death in the jungle. Malaria and dysentery also took their toll. Another shipload of prisoners was sent down, but at the end of the first seven months out of a total of seven hundred arrivals only just over four hundred remained. Walker's report to the Governor General in India was not well received. He was severely reprimanded, and ordered to lessen the harshness of his discipline. Better behaved convicts were to be allowed to send for their families from India if they so wished, and were to be trusted as overseers. He was also ordered to conciliate the aborigines. The British have left many of their names throughout the islands to the modern day: Mount Harriet, the 1,200 foot mountain near the mouth of the harbour, at the foot of which Lord Mayo, then Viceroy of India was murdered in 1872 as he stepped ashore from his launch; Corbyn's Cove named after a chaplain attached to the Settlement - a beautiful sandy beach fringed with casuarina, upon which the Japanese invasion forces landed when they took the islands. Havelock, John Lawrence and Henry Lawrence and other small islands lying off the main chain are all called after soldiers or statesmen of the day. It was upon the island later known as Sir Henry Lawrence that, in 1844, two troopships, one having sailed from Gravesend and one from Sydney but both bound for Calcutta were wrecked within a few hours of each other and within a few hundred yards of each other. For seven weeks the officers, men and their families lived on the island, observing all the rules and regulations of normal garrison town, while the Andamanese watched from the dense cover of the jungle, ready to attack anyone who strayed far from the encampment of tents improvised out of the ships' canvas. Rescue came just before Christmas. As the last boat load of castaways left the beach the natives moved in, swarming over the wrecks and the deserted camp, shouting defiance. In 1867 four of the earliest Victoria Crosses were won upon the Little Andaman by a surgeon and three privates of Her Majesty's 24th Regiment. The Onges, one of the tribes, who generally kept to Little Andaman, had been particularly troublesome, and when news came to Port Blair of their having murdered five men from a Chinese junk who had gone ashore for water, a punitive expedition was sent there, with instructions to try and take prisoners so as to be able to establish some relationship with the islanders. There is no sheltered bay in Little Andaman, and the SW monsoon had started, but three boat loads of soldiers managed to get ashore through the heavy surf. The Onges, armed with spears and bows, appeared at once and, ignoring efforts to parley with them, attacked the soldiers. The soldiers opened fire. It was impossible to estimate how many Onges were hit as the moment a man fell his comrades dragged him back into the undergrowth. The 'battle' went on for several hours, then when the ammunition showed signs of running out, the ship's boats, which had in the meanwhile been cruising up and down outside the breakers, were signalled to come and take the soldiers off the beach. By now the weather had worsened: the first boat was swamped and the second lost her rudder in the surf. It was then that Dr Douglas in the third boat, a gig, took over. Calling for volunteers from the rudderless boat, he, with four privates at the oars and an Indian seaman at the helm started for the beach. Before reaching the unbroken water they turned the boat about and approached the sands stern first. Then, loaded with as many as she could carry the gig struggled out to where the other boat waited. Transferring the rescued soldiers into her, Douglas and his crew set off once more. Three times this manoeuvre was repeated before everyone was safely off the beach. By then the men at the oars were almost collapsing with exhaustion, but in that sea it was not possible to relieve the rowers. On the last trip an oar broke hitting and fatally injuring the oarsman. Gradually the Penal Settlement grew in size, spreading outwards from Port Blair. It specialised in housing so-called "hard-core elements". Jungle was cleared. Coconut trees, bananas, rice and vegetables were planted. On the Southern promontory of the Harbour the big, stone built jail was erected in 1896, planned originally on that of the new jail in Pennsylvania in the United States, but altered so that it more closely resembled the new penitentiary at London's Pentonville, with corridors of cells radiating like the limbs of a starfish from a central control and look-out point. On Ross Island, half a mile outside the mouth of the harbour, a church, barracks for troops, an officers' mess which also did duty as a club, and a fine Government House for the Chief Commissioner soon sprang up. Government House, like the hospital and all the officers' and jailors' houses, and the shops in the little bazaar in the district known as Aberdeen, were all of wood with red painted shingle roofs. In time a golf course, tennis courts and a football ground came into being, and a school for the children of self supporting convicts who had sent for their families from India and Burma was built. Indeed, the archipelego's principal role for the next century was basically as a convenient penal colony for so-called "hard-core elements". This role was confirmed with the construction of the huge cellular jail in 1896 which had 698 cells specifically designed to maximise isolation of its inmates. Some of the convict Self Supporters worked in the Forest Department in North Andaman, others in the small dockyard at Phoenix Bay halfway up the harbour. Some became overseers in charge of gangs building roads, while others were assigned as domestic servants to British officials, getting a small wage, drawing rations from the government commissariat and living in one-roomed wooden quarters in the compound. The majority of these servants were murderers, but never those who had used poison, it being considered that poisoning could become a habit. Thieves and forgers were also seldom employed as house-boys, cooks or gardeners. At one time there was a female jail in Port Blair, but the women proved too troublesome, and after a few years it was closed. It was an escaped convict, Tewari, an ex-soldier, who in the early days of the colony undoubtedly saved many lives, both of officials and convicts, by returning from where he had been living with a group of Andamanese who had befriended him, to the Settlement with the warning that a sudden assault by all the Andamanese round Port Blair was about to take place. He had been with the islanders long enough to learn their language and had heard the plans being made. As it was, if it had not been for the help of the vessels anchored in the harbour 'the 'Battle of Aberdeen' as it came to be called, might have gone badly for the Settlement. Tewari was handsomely rewarded, pardoned, and sent back to his home in South India. It was a free servant who accompanied his master down to Port Blair who ruined much of the grazing round Port Blair by bringing with him a flower pot containing a plant commonly known as the 'Sensitive Plant'. He was fascinated by the way the leaves closed when touched. Unfortunately it is covered with extremely sharp prickles. Winds soon scattered the seeds, and before long much of the land which had been cleared was covered with the plant. Burning and ploughing had little effect and it was a long time before the land could be used to graze buffaloes or cattle. Even goats shunned the Sensitive Plant. The defence of the Andaman Islands was included in the defence of Burma during most of this period. Its military importance lay in its seaplane base and in the possibility of establishing an aerodrome base there, and in its potential value to the enemy as a submarine base. At that time there was still only one company of British Infantry there, stationed on Ross, but now a battalion of Gurkhas arrived. When Rangoon fell the whole garrison was withdrawn from Port Blair, and everyone, officials, convicts, and free settlers was evacuated with the exception of those Indians and Burmans who had grown up there and knew no other home, and three British officers who insisted on staying behind, feeling it their duty to remain at their posts. They were Mr Waterfall, ICS, the Chief Commissioner Andaman and Nicobar Islands at that time; Major Bird, his Secretary, and Mr R.W. Lindsey, the Executive Engineer. It was Major Bird who was executed by the Japanese, accused of destroying official papers and somehow conveying information to the British in India. Mr McCarthy, of the Indian Police, spent some time on t he west coast, living in the jungle and managing to send information without being discovered by the Japanese. It was during this period that Netaji Subhas Chandra Bose (an Indian nationalist who collaborated with the Japanese) raised his national tri-colour at the top of the Government House - proclaiming an independence of sorts - although the brutality of the Japanese won them few converts amongst the locals. In a report by the Supreme Allied Commander SE Asia, Vice Admiral the Earl of Mountbatten, dated 1943/45, there are several references to bombing raids on Port Blair, some of which could have been as a result of information sent out. by McCarthy. After the Japanese surrender, troops of the 7th/1st and the 8th/6th Rajputana Rifles were landed on the Andamans. They met with overwhelming joy. Food and medical supplies had sunk to a dangerously low level. On Interview Island, where some Indians had been marooned by the Japanese, people were dying of starvation. The Japanese garrison, estimated at about 20,000, was so on rounded up. 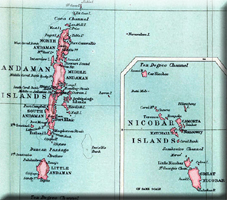 The prisons were not reopened when the islands were reconquered in 1945. Two years later India achieved its independence.